Interceptors are the basic building block of features in Pedestal. The core library provides interceptors that are generally useful for creating HTTP web services. Applications augment those with their own logic to handle. An interceptor is a pair of unary functions. 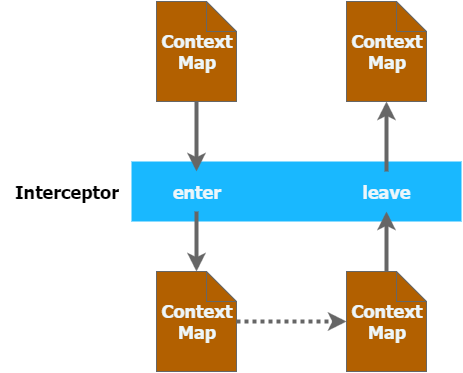 Each function is called with a context map and must return either a context map or a channel that will deliver a context map. Either the :enter or :leave function may be omitted without harm. This isn’t implemented as a regular Clojure or Java call stack. That would not allow interceptors to return asynchronously. Pedestal creates a kind of "virtual call stack" out of the interceptors' data structures. Pedestal keeps a queue of interceptors that still need to have their :enter functions called. There is also a stack of interceptors whose :enter functions have been called, but their :leave functions have not. As such, the :leave functions are called in reverse order to the :enter functions. Both the queue and the stack reside in the context map. Since interceptors can modify the context map, that means they can change the plan of execution for the rest of the request! Interceptors are allowed to enqueue more interceptors to be called, or they can terminate the request. A basic interceptor is shown here. This interceptor has only the :enter function. Interceptors executing after this one would be able to access the ::guid key on the context map. Maps are commonly used to represent interceptors. While this is fine for interceptors used in routing vectors, it can lead to issues in other cases. More on that below. It is a good practice to use namespaced keywords for data you attach to the context map. Notice that this interceptor expects some other interceptor(s) to add data to the context using the ::tx-data key. In addition to closing over the argument uri, we’re using an anonymous function for the :enter function here. Interceptor functions must return values. Returning nil will cause an internal server error. An :enter or :leave function may return a context map directly. In this case, processing continues with the next interceptor. If the interceptor will take a long time to return a result, it may also return a core.async channel. Pedestal will yield the thread and wait for a value to be produced. Only one value will be consumed from this channel, and it must be a context map. A common usage for the second case is when making outbound service requests. Use a go block as the return value, and Pedestal will expect an asynchronous response. The :enter, :leave, and :name keys are used directly. The function is interpreted as a "handler". See below. The list is evaluated and its result is used as an interceptor. The symbol is resolved and its target is used as an interceptor. The var is dereferenced and its value is used as an interceptor. Most of these cases are provided to make routing syntax easier. Applications should mainly use the map form as shown in the earlier examples when defining interceptors for routing purposes. 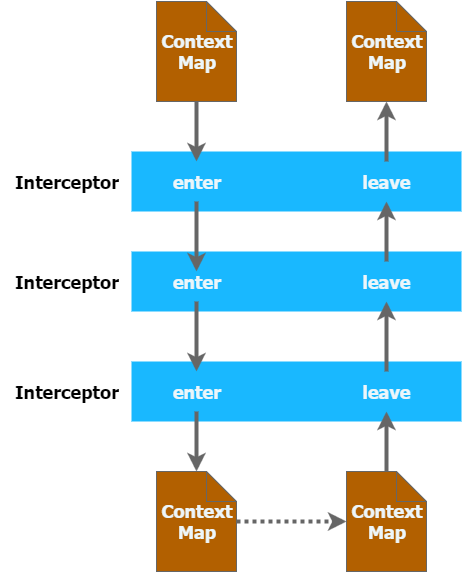 The queue of interceptors remaining to execute is held in the context map. This means that an interceptor can enqueue other interceptors to be executed. In fact, this is how routing works. The router is an interceptor that matches requests and enqueues the desired interceptors when a route matches. Use enqueue to push more interceptors onto the queue. Use terminate if processing should not continue. Interceptors that are explicitely enqueued by the application must be defined using the io.pedestal.interceptor/interceptor function. This function takes a value which extends IntoInterceptor and returns an Interceptor Record. This is not necessary when constructing interceptors used in routing because interceptor representations are transformed to Interceptor records during route expansion. A "handler" function is a special case of an interceptor. It plays the role that a handler function plays in other web frameworks. Pedestal treats the handler as a function that takes a request map and returns a response map. A handler does not have access to the full execution context. Therefore, it cannot manipulate the interceptor queue or stack. Because a handler takes one kind of thing (request) and returns a different kind of thing (response), it can only be used in the last position of a stack. Pedestal supports defining interceptor-specific error handlers via the :error key. Refer to the Error Handling reference for more details.